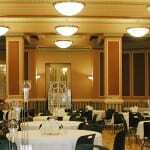 Custom Services: Each event or wedding is unique and may require specialized services not listed here. This package basically is the initial sit down planning consultation stage where we discuss and identify general needs and brainstorm the various aspects of your event. We will discuss everything from the schedule to vender referrals. Call for prices. This package includes the above plus the initial contact with all the vendors and 2 meetings to formalize decoration ideas and to formalize your reservation date. Call for prices. This package includes all the above plus, we sit down with you to create a custom timeline and schedule to coordinate a smooth progression and execution of your plans. We will also keep weekly and monthly contact with all parties involved to ensure a wonderful experience. 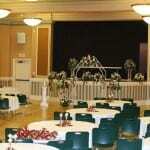 Some people prefer to plan and implement their own events, or may choose to only have us help on the day of the event. What ever your needs, let us worry about those details. Reservation is not confirmed until deposit payment is made. The Martin Hotel was a building of 350 rooms, completed in 1913, enlarged in 1918 and then converted in to apartment living in 1981. It was then added to the National Register of Historic Places in 1982. As a hotel, it had ranked with the finest in the country in furnishings and appointments. 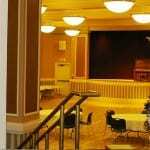 Located in the very heart of the downtown district at the convergence of Fourth and Pierce Streets, the old Martin Hotel and its “Commodious lobbies”, mezzanine floor and public spaces are utilized for practically all of Sioux City commercial and social gatherings requiring a meeting place or a banquet. The Martin was a unit in the “Hospitality Chain” of the Eppley Hotels Company (E. C. Eppley, president), which also operated the Fontenelle in Omaha, the Carpenter and Cataract in Sioux Falls, the Lincoln in Lincoln, the Montrose in Cedar Rapids, and the Lincoln in Scotsbluff, Nebraska. To the stranger, it was the very personification of the hospitality of the west. 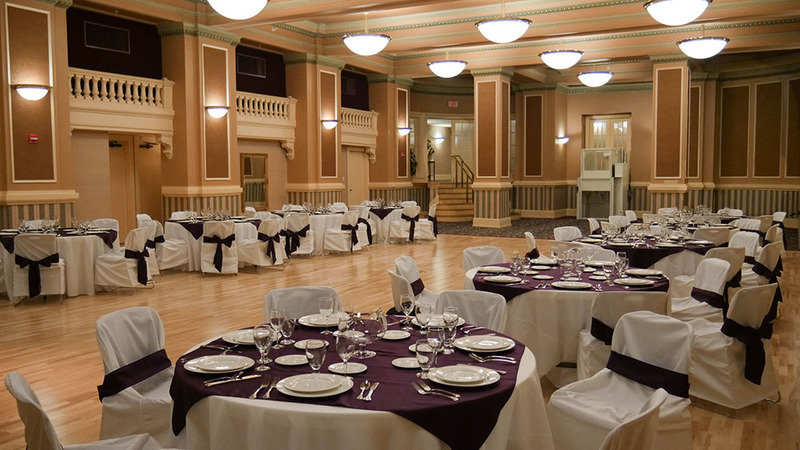 The Martin building and Ballroom is truly a commodity of Sioux City, both in location and in beauty. The Martin Hotel was significant in the areas of architecture and commerce. Built in 1912 by J.P. and L.B. Martin, two brothers of an influential Sioux City family, the Martin operated until 1963. 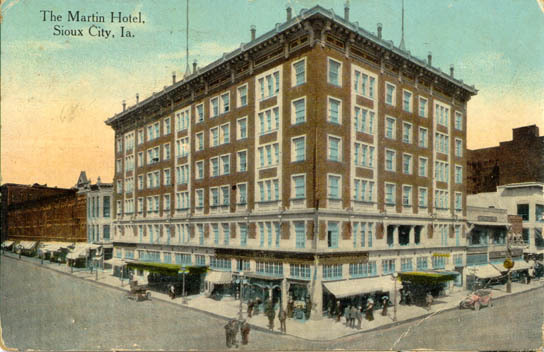 It was one of the leading hotels in Sioux City. In the 1944’s it was purchased by Eppley Hotels. E.P Eppley of Omaha, Nebraska owned a chain of hotels in the upper midwest. He purchased it following the death of both Martin Brothers, thus insuring the continuance of the business. The Martin remained one of the prominent hotels in Sioux City and in 1956 when Eppley merged with Sheraton Hotels its reputation appears to have been enhanced. In 1963, when the building was finally sold, the Sheraton Hotel chain condition of sale was that the building was not to be used as a Hotel, ended the century old tradition of a hotel being at that location. 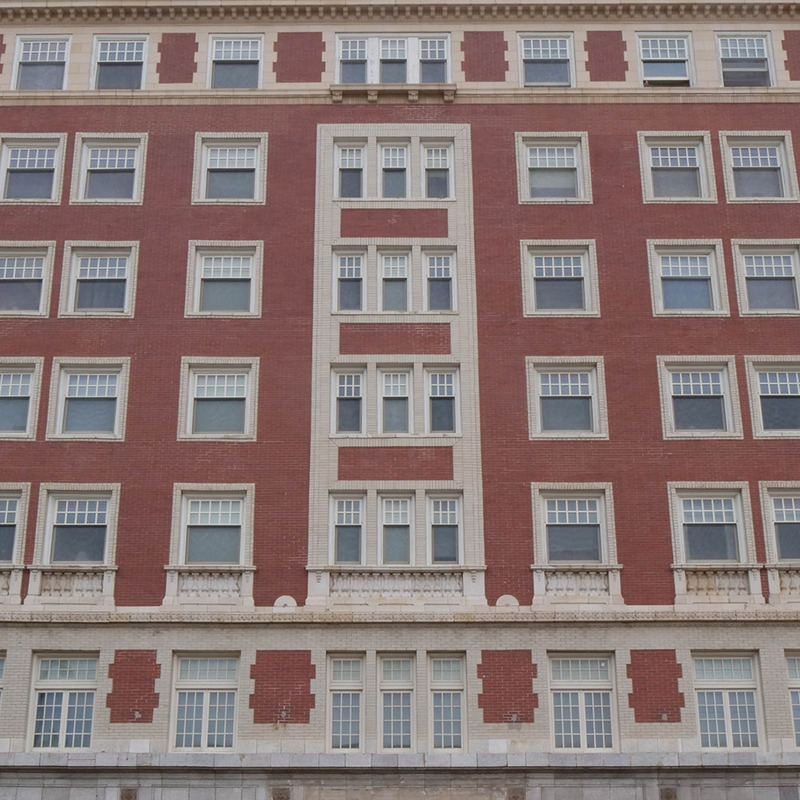 By 1983 the Martin changed hands, Weinberg Investments developed a project based Section 8 substantial rehab of a 1900’s era historic hotel located in the heart of the Business District. Due to HUD’s reluctance to provide FHA insurance for the project, mainly because of the first two floors were scheduled as retail, the project was split into a horizontal property regime, with Martin Tower having the upper six floors. The Project was equipped with two elevators, eight stories in height with 86 one bedroom units for the elderly and handicapped and a community room on third floor. Access to the property was via easements through first and second floor areas, including access to the City skyway and ramp parking systems from the second floor. Then in the years of 2000 through 2003 the initial development group consisted of Weinberg Investments, Inc. and Sioux Falls Environmental Access, Inc. which is a 501(c)3. Weinberg Investments, Inc. had 20 years experience in affordable housing during 2003. The new partnership, as step one, applied to the Iowa Finance Authority (IFA) for funding and received 4% Low-Income Housing Tax Credit program (LIHTC)’s, via tax exempt bonds to acquire and rehab the existing 80 units and add 6 additional units and an added community room on second floor. The second floor was purchased from the City for $1.00 based on a redevelopment agreement to add the improvements previously stated. This additional expansion allowed the project to qualify a second time for Federal Historic Tax Credits as well as State Historic Tax Credits. A HUD Service Coordinator grant has also been awarded to the project. 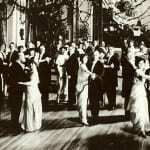 During this phase the complete rehab of the Martin ballroom also took place. Rehab was done with all residents in place and included in the units; new kitchen and bath cabinets, fixtures, appliances, light fixtures, carpeting and painting. In common areas; new lighting, carpet , wall paper, painting , fire and smoke detection upgrade, expanded entry lobby and new security entry system. The largest challenge however, was the replacement of the existing two pipe heating and cooling system, with a ground water source heat pump system. Water for the new system is provided from a 350’ well, drilled in the sidewalk right-of-way in front of the building with access granted by City easement. Interim and permanent tax exempt financing for the project was provided by Security National Bank, Sioux City, IA in the amount of $3.8 million.